For forty seasons, The Ohio Light Opera has dedicated itself to the exploration and production of the best of traditional operetta and musical theater. 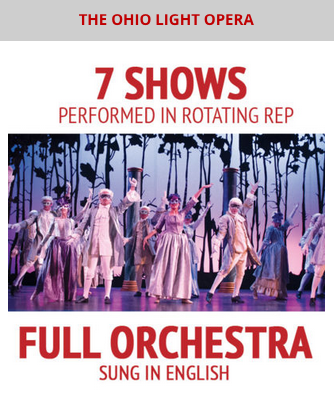 Founded by James Stuart as a Gilbert and Sullivan repertory summer festival, the company has grown to encompass all forms in the light opera canon. This includes the complete Gilbert and Sullivan repertoire, as well as the recognized treasures from the Viennese, French, Hungarian, German, and American repertoire. Over 100 company members from around the United States are selected each year to become a part of our residency program. The 40 performing artists who make up the vocal ensemble are chosen for their abilities to perform and work at the highest level in all disciplines demanded by the company’s specialized repertoire: singing, acting, and dancing. With over 120 titles produced, over 200 productions, and 550,000 patrons watching, The Ohio Light Opera has become the forerunner in promoting the light opera genre. Application deadlines for singers for the 2019 Festival Season are approaching quickly. Deadlines vary by audition location with deadlines for major cities like New York and Chicago coming quickly.